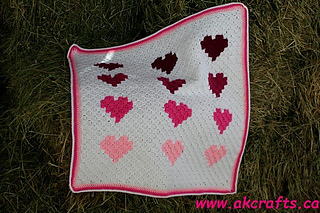 I did crochet the Afghan with Schachenmayr Bravo Yarn in white, pink, cyclamen, fuchsia and raspberry with a 4 mm hook. My pattern includes full instructions and step by step photos ! So it is suitable for beginners. You are welcome to sell your finished items. I would be happy if you give me credit for my pattern and include a link to my shop in your listings.